ዘለ-ኣለማዊ ዝኽርን ፡ ክብርን፡ ንኹሎም ስውኣትና !! Esayas Afeworki, the Arch Enemy of Eritrea and Eritreans Must Go!! Esayas Afeworki, the arch enemy of Eritrea and Eritreans, did not join the Eritrean war for Independence from Ethiopia, as we were deceived to believe. When Esaya was a student at the university of Ethiopia, Addis Ababa,in 1965, Eritrean Liberation Front (ELF) cadres visited the University in order to recruit Eritrean university students for clandestine work of the ELF. In the Cadres’ efforts, they managed to meet a group of seven students, and Esayas Afeworki was among them. Right, after the ELF cadres left, the students continued the discussion, and according to two of those students, Esayas was the only one who negatively commented, saying that he does not want to be an instrument of Muslims. His comment showed his bias against Muslims and his eventual intensions. Esayas did not take very much time to be recruited by Ras Asrate Kassa, the then Ethiopian Governor of Ethiopia, in Eritrea, and the American CIA, according to the late Tesfamichael Georgio. He also, deceptively joined the Eritrean Liberation Front in 1966, for the purpose of sabotaging and disrupting the ELF from within, during its armed struggle for Eritrean Independence from Ethiopia. That means, Isayas did not join the Eritrean armed struggle for the purpose of Eritrean liberation, as many of us were deceived to believe, but to intentionally sabotage and disrupt the movement from within, and also to espouse his dream of becoming the echelon of the movement. Within a short time after joining the ELF armed struggle, Esayas maneuvered his way up the leadership ranks, where he systematically and skillfully started to form a new political group for the purpose forming his own political group, called the Eritrean Peoples’ Liberation Front (EPLF) from within the ELF, in 1970. He was also the mastermind of continuous skirmishes and internal wars between the ELF and the EPLF. As a result of such internal wars, many combatants from both political fronts were unnecessarily martyred. When the Eritrean people were unsuspectingly focusing using on fighting the Ethiopian occupation army, with a spirit of obsessive nationalism, they failed to notice that Esayas instigated mysterious internal wars between the ELF and EPLF, and he was mysteriously and systematically liquidating the cream of the crop of the Eritrean political cadres,, from both Fronts, whom he felt would be a threat to his becoming the eventual supreme Leader of Eritrea. His most powerful ability was to create a highly secretive and potent security apparatus, which effectively operated unnoticed until the day of independence, without even the knowledge of some in the ranks, who were e supposed to be his comrades. The security agents have been secretly eliminating combatants and civilians with Essayas’s direct and in direct orders. In some cases, the ordered killers were immediately being eliminated to keep his dirty schemes leak proof. Essayas is a con artist, who outsmarted, out foxed, and out maneuvered the Eritrean people, as a whole for over 40 years, without being seriously abated. Such immense power is unprecedented, and it will shame all Eritreans for generations to come. Esayas, by nature, has a highly erratic mind, arrogant, vengeful, and iron fisted, and yet, he couldn’t face any serious challenges from any individuals or groups, which is very unusual phenomenon that no logic or common sense can answer. Even though more Eritrean political cadres were directly or indirectly killed in the hands of Esayas Afeworki than those martyred in the battles against the foreign enemy, Eritrean people failed to pay attention due to their obsessive spirit of nationalism to pay attention to Esayas’s internal sabotages for a long time. Esayas became an expert in implementing a socio-political doctrine of falsehood and mistrust amongst the Eritrean people, which subsequently resulted in weakening the strong social, religious and cultural fabric of the Eritrean society, at large. The most ironic aspect of the Eritrean war of independence was that despite the fact that Esayas has always been one of the main authors of the internal infightings of Eritreans against Eritreans, and the main architect of continuous secret disappearances of many gallant Eritrean fighters, no Eritrean, ever, had the nerve to stand up against him. In addition, he managed to always deceptively claim an unearned recognition and fame, when indeed, he, himself, had never fired a single bullet against the Ethiopian army of occupation. This clearly shows that Esayas’s concern was to make sure that he maintains a safe path to his eventual becoming the supreme leader of Eritrea, for life. All the bad things he has shown us from day one can attest to that. One of the biggest damages he has perpetrated against the Eritrean people is that he has completely destroyed our culture, our faith and spirit. After Eritrea gained its independence on May 24, 1991, Isayas Afeworki, the self proclaimed president of Eritrea for life, and a handful of collaborators, defiantly took power by betraying the Trust of and the Promise to their martyred colleagues and they have ended up destroying the country beyond repair, politically, socio-economically and diplomatically. A significant percentage of our people are either arbitrarily tortured, or imprisoned, killed or forcibly displaced leaving their loved ones behind. Eritrean youth and children above the age of 16 years, are conscripted by force, for a meaningless and un ending slavery in the name national military service. This military service was supposed to be eighteen months long program, but almost all of the Eritrean participants are intentionally kept in the program for multiple rounds, and some times, as even long as 20 rounds of service. This is a tactful scheme, whose main purpose is to keep them disturbed and restless, so that Esyas can stay in power, forever. Eritrea, is unusually a country which has closed its single university, and remains to be without a national constitution for 27 plus years. 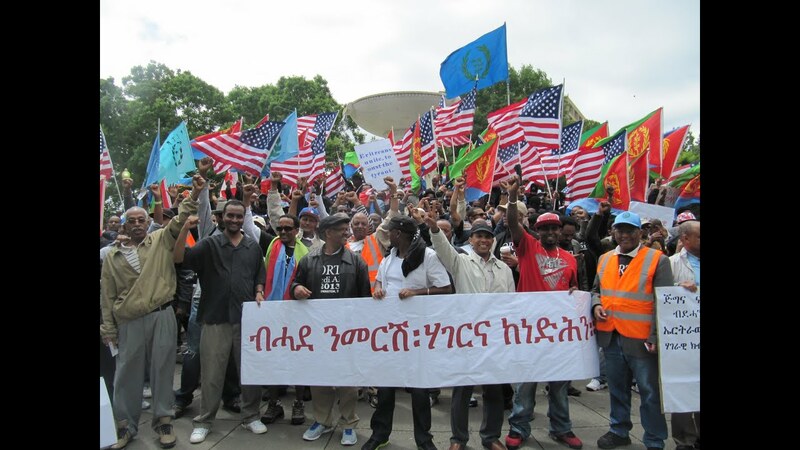 Esayas has denied Eritreans to invest their resources, their skills and professions for the service and development of their country. There is no economic planning for the welfare of the people, nor any health or social services. He does not believe in educational systems for the young people, and we can safely say that Eritrea is one of the few or the only country that denies its people the opportunity to get the benefits of the free American DV1, visa system. The lives and well being of Eritreans has never be in his DNA. In order to annihilate and displace the Eritrean people, he got us into unwanted war with Ethiopia, and despite their much lesser in numbers, he did not arm our combatants with relatively comparable weapons. Eritrean farmers cannot farm and feed themselves and workers cannot work. Religious people cannot worship. He has always, single handedly, ruled the country by intuition and decrees, and he is always safely, in full control of the country, and its people . By keeping the wealth of the to himself, the country is now teetering on the brink of economic bankruptcy. It is, therefore, incumbent upon all Eritreans to get rid of this greatest cardinal of sin, before he sells the country to the highest bidder. Long Live Eritrea, and Eternal life to our Martyrs. Our Unity and eventual Victory is imminent.